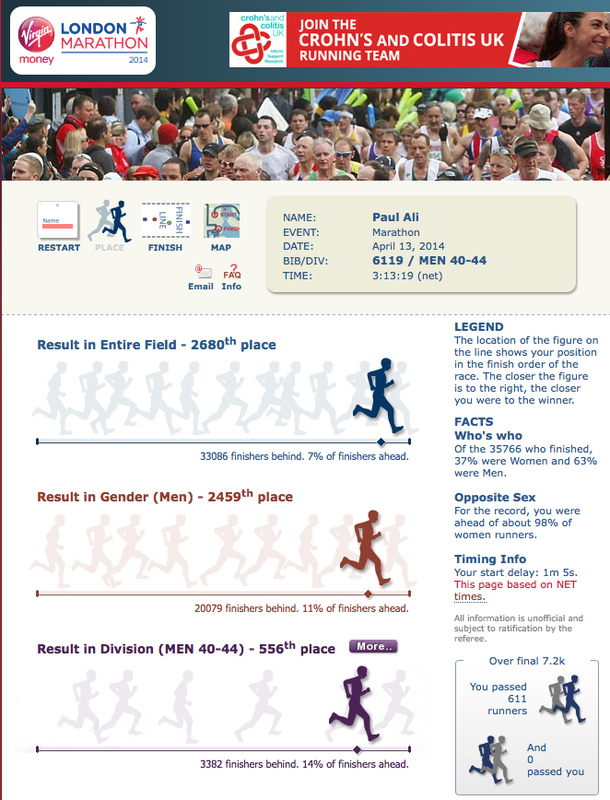 When I first took up running a few years ago I started to put enter myself in the ballot on an annual basis. 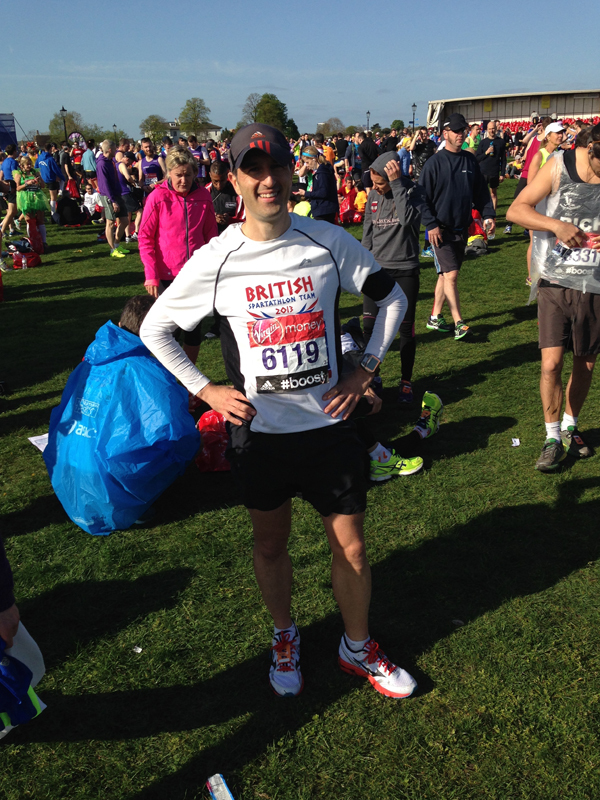 I took the view that it would be easier to aim for a ballot entry than run a “Good For Age” time as quicker marathon times seemed a little out of reach whenever I did try a marathon effort they seemed to hurt a lot more than a comfortable 50 miler! A lack of proper speed endurance training is the main reason why, I like to run miles but admit that the quality of my training (i.e. speedwork) could certainly be improved but I get by on what I do and it’s nice to think that there’s always room for improvement. After my 5th ballot entry I was lucky enough to get a place. There was a scheme in place a few years ago where if you entered 5 years in a row you would be guaranteed an entry on the 6th. However, as this scheme was heavily oversubscribed it has now been withdrawn but thankfully I was in the last group of people they would honour. 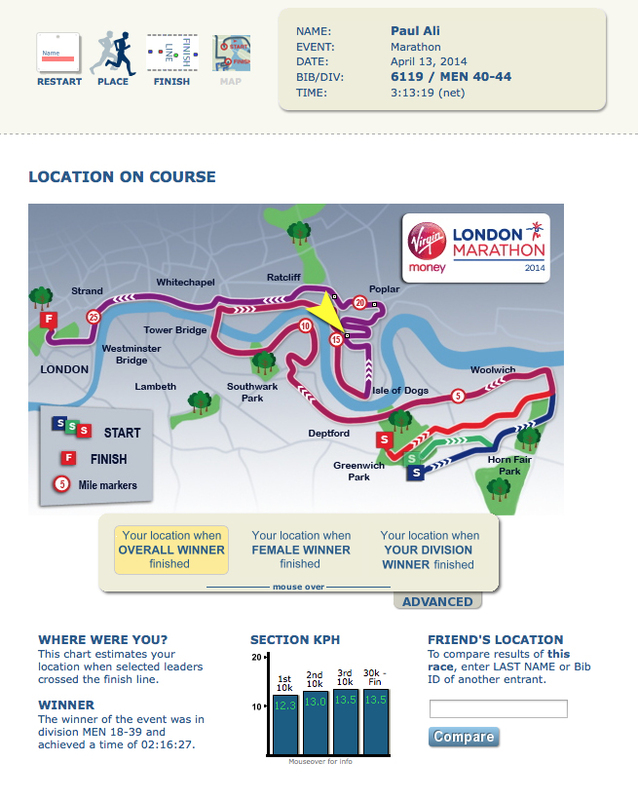 I actually received my London confirmation last September when I was out doing the Spartathlon and knew I had a place for 2014. As my race calendar started to fill up with Ultra events, London Marathon fell into the category as training run/fun run in the build up to the Thames Path 100 with the South Downs Way 50 taking place a week before and the Enigma Good Friday Marathon a few days later. 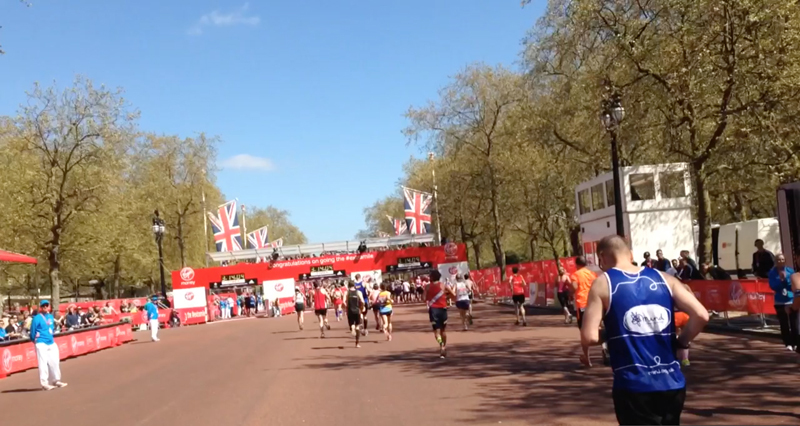 I knew London would be busy and congested with 35,000 other runners so had decided to just enjoy the run, the day, the crowds and the atmosphere. I didn’t want to run London in a bubble purely focused on a time which would measure the outcome of the day, I wanted to enjoy it. 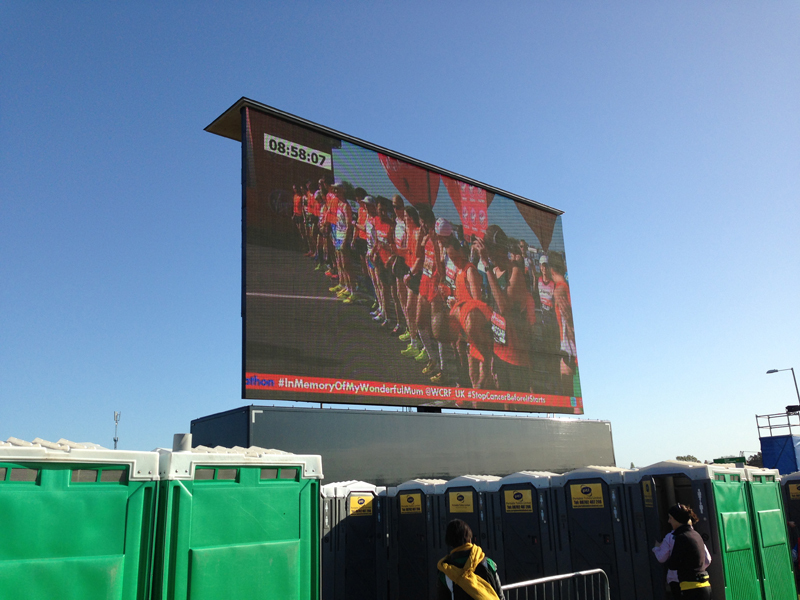 The start of the race was well organised with a large area for runners to sit around (I was in the Blue Start, Pen 3), lots of toilets including portaloo’s and a standup urinals where you stared another runner in the face whilst both using two urinals placed opposite each other in front of you with a small barrier between which felt a little uncomfortable. I was waiting around the start line with my running buddy Matt Coggins mulling over whether I should have a little pop at my Marathon PB. It was Goal 4 on my 2014 Running Action Plan here so I would need to do it at some stage and I was feeling pretty good after last weeks South Downs Way 50 miler and I thought my marathon time was a little soft and a 3.15 sounds so much better. I had even had a massive two days off without running! 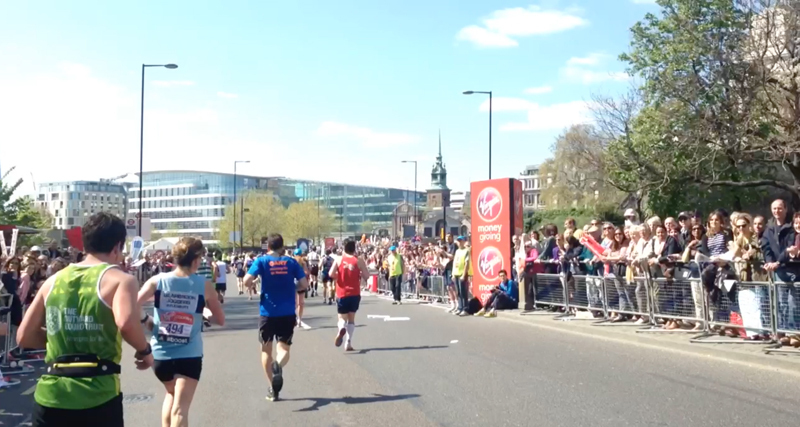 The only problem was 35,000 other runners in the way in one of the most heavily congested marathons around. I settled into my starting pen and bumped into Hideo Takano and we had a brief chat before the race started. As the clock struck 10am the race started and the crowd of runners started to move off together in one collective group. 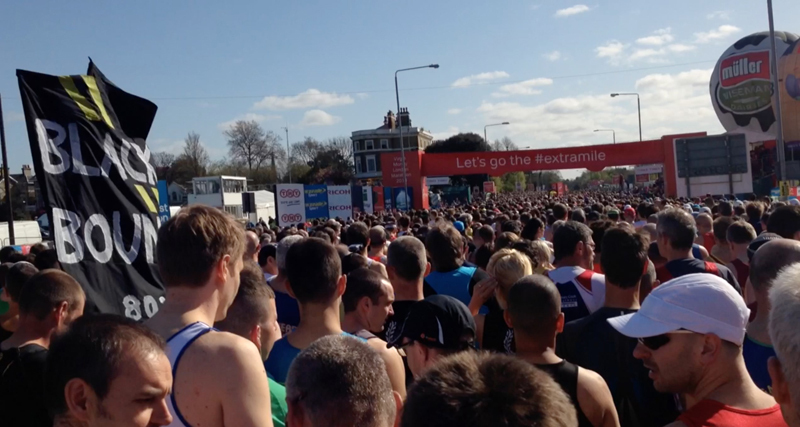 The start of the race was busy due to the volume of people and it was difficult to settle into the pace you wanted. Almost immediately, I thought there was no chance of a fast run today as we were struggling to get below an 8m/m pace for the first mile (8.20m/m first mile) and I didn’t want to be that person (like the Wimbledon Windmill runner I spotted) charging in amongst the crowd to find that gap and becoming a bit of a nuisance. So getting into the “Never mind, I’ll just enjoy the run” category, I settled into the groups pace and started to take some pictures and video footage with my phone of the race from a runners perspective. The first few miles were steady as we headed out from the start at along Shooters Hill Road towards Woolwich Common. 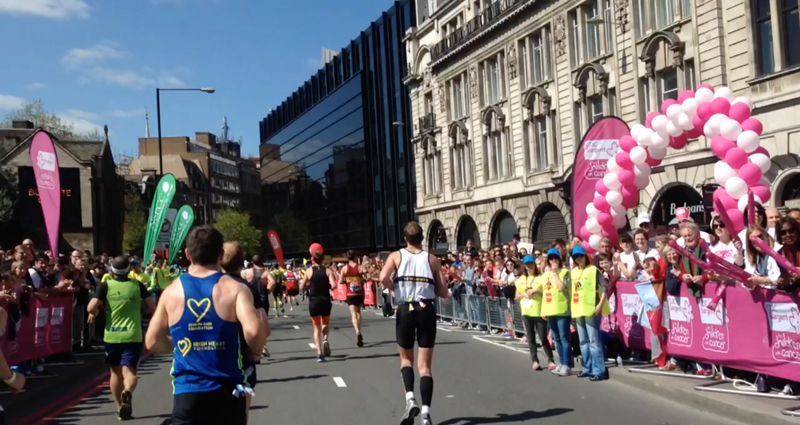 The crowd support was great with loads of people out and about cheering on the runners. It was reported that we had an unusually high turnout for the race, largely down to the good weather along with the “Mo” factor. It was warm at and I felt like I didn’t need a base-layer and a t-shirt but I’ve survived Spartathlon so couldn’t grumble about a little warmth at London and carried on. The pace was steady at first averaging between 7.30 – 8.00 m/m for the first few miles and I felt pretty comfortable apart from a gradually building desire to use the toilet. This is not usually a problem on a remote trail with lots of bushes and vegetation but is somewhat a little harder to find a suitable spot when you are running through residential and office districts in the middle of London. Thankfully, there were toilets near each mile point and so I knew there would be opportunities ahead to stop. The first few miles passed without incident, it was still busy on the course, the weather was good, the crowd support was excellent and the pace was comfortable, There must have been some other chap called “Paul” running near me as I kept hearing “Go on Paul” and kept looking around but didn’t see anyone I knew. After a few miles some of the different coloured starting zones converge and there was some good natured booing between different start times with some good old British sense of humour. I spotted a spectator quite early on wearing the “Centurion Ultra Team” yellow t-shirt. It may have been Craig Holdgate but I only tend to see the back of him at races as he hurtles on ahead of the rest of us so couldn’t be 100% sure. We headed through Charlton in the first few miles passing the water stops. Each mile was marked with a huge balloon banner and mile marker so these were easy to spot along with a timing display. I had crossed the line a minute or two after the race start so it gave me a fairly accurate time reading which was steady as I passed the 10k mark in a very steady 48.35. No, no PB today as I’m several minutes over my 10k PB already. The course went around the Cutty Sark around the 6 mile point which stood out as the first highlight and the crowd support here was superb. 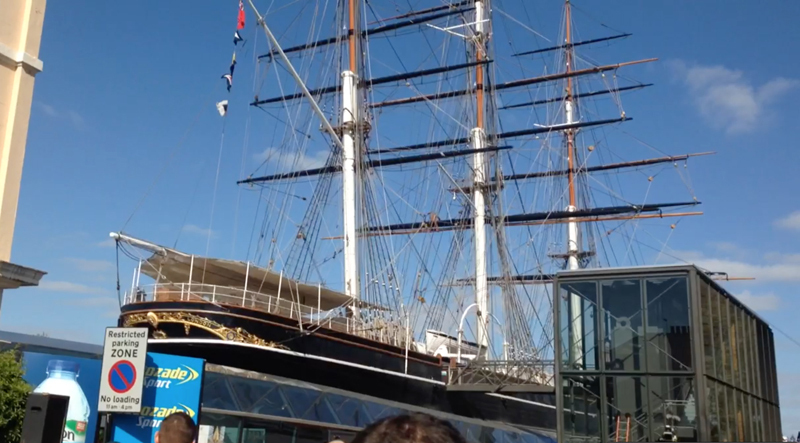 I quickly whipped out the camera to capture some video footage as we ran around this landmark point and carried along parallel to the river Thames. At the 7 mile point I caught up with the chap dressed in a chicken outfit who was rightly getting lots of support and cheers and drifted past him feeling good apart from the increasing need for the toilet as the pressure was building in the groin area. I started to look out for little back alleys I could nip off to en route but thankfully just after the 8 mile point there were some portaloo’s situated right next to the course and even better I could see the green sign on the lock meaning one was vacant. I dashed into the loo and managed to have what seemed the longest wee in the world but felt so much better after wards. A few other runners seemed to have the same idea as I could hear the crash of other runners as they slammed into the neighbouring portaloo’s, relieved themselves as quickly as possible and dashed out. As I finished and headed back out, I could see the chicken man again ahead again so maybe lost 30-seconds to a minute and not the eternity it had seemed. I continued to run at a steady pace drifting past runners ahead and not really staying with anyone long enough to break into a conversation and so I just settled into the running and enjoying the atmosphere and spectacle of the event. The only celebrity I spotted all day was Tony Audenshaw (Bob Hope from Emmerdale or Tony from Tony’s trials) who was wearing a pair of “comedy cheeks” (the rear kind) and was giving a bit of banter to other runners as I drifted past him. 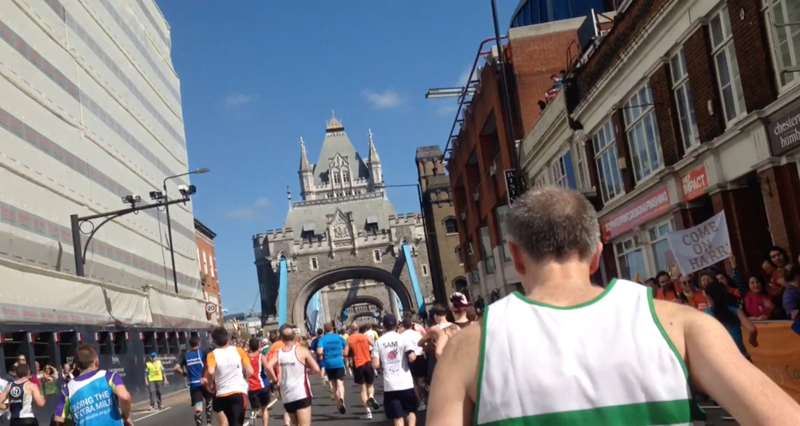 Tower Bridge was another big landmark moment where the crowd support was fantastic. Many of the charities supporters and groups really stood out with their colourful displays and t-shirts and were noisy and vibrant. Unfortunately, despite looking out at the crowd and trying to soak up the atmosphere I missed every single Fetchpoint but did hear someone shout “Avon” so maybe someone did see me. I arrived at the halfway point in 1.40 (10mins slower than my Half Marathon PB) and felt really comfortable, The crowd of runners had started to thin out a bit and I started to feel as if I had a bit more room now and continued to drift ahead of runners. As I was feeling good I started to push a little making a conscious effort to drift ahead of runners and not settle in behind them and so I started a subtle weaving around runners. The pace picked up and I was now running between 6.45 – 7.15m/m. 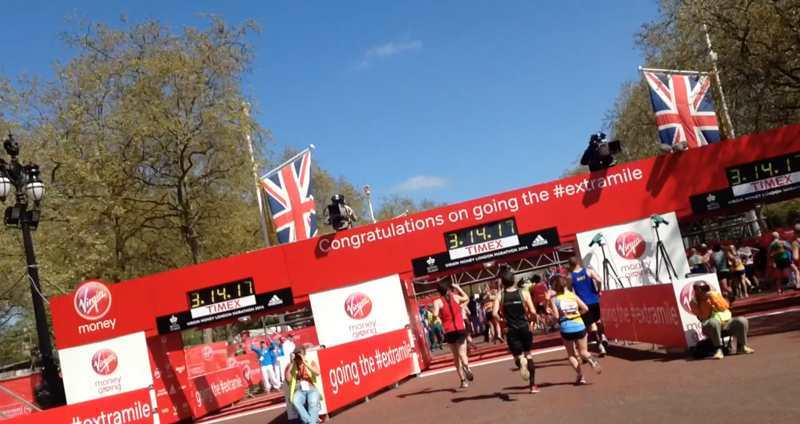 The third major highlight was seeing Mo Farah. There was part of the course where it doubled back on itself (13-14 miles out and 22 miles back) and I could see the motorcycle coming towards me ahead of the lead runners. 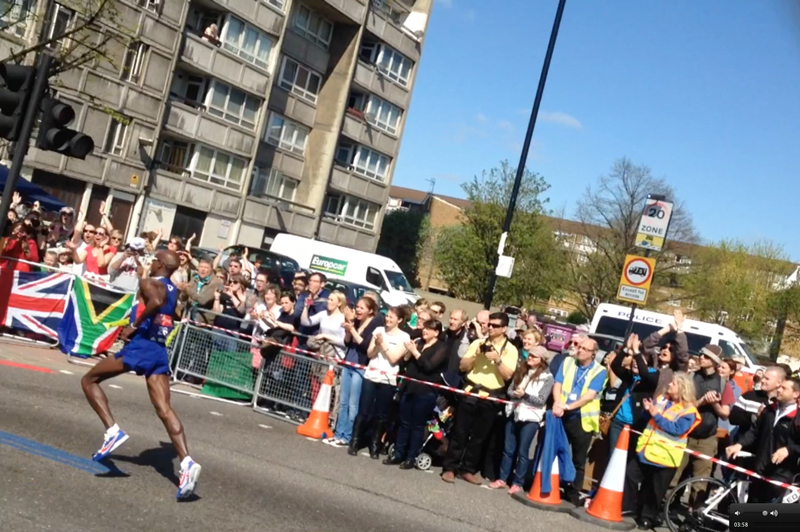 I quickly grabbed my camera as I was running and waited for Mo to approach. 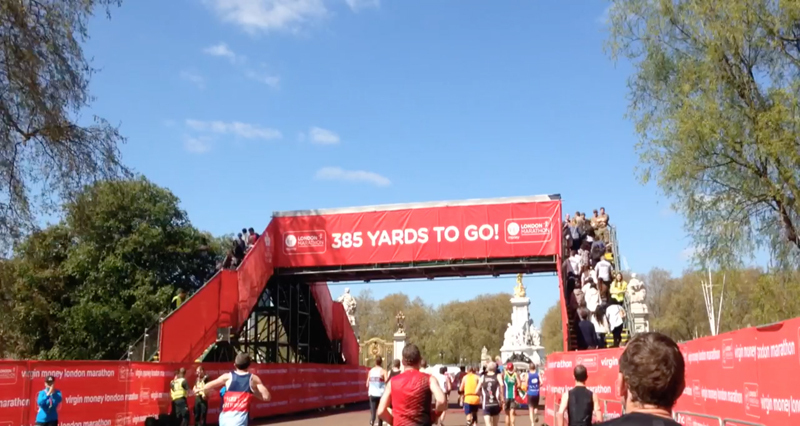 Unfortunately he was 45 seconds behind the lead group of runners who were running a blistering pace and I managed to capture a brief bit of footage as I led a chorus of “Come on Mo” shouts which was picked up by the other runners around me. 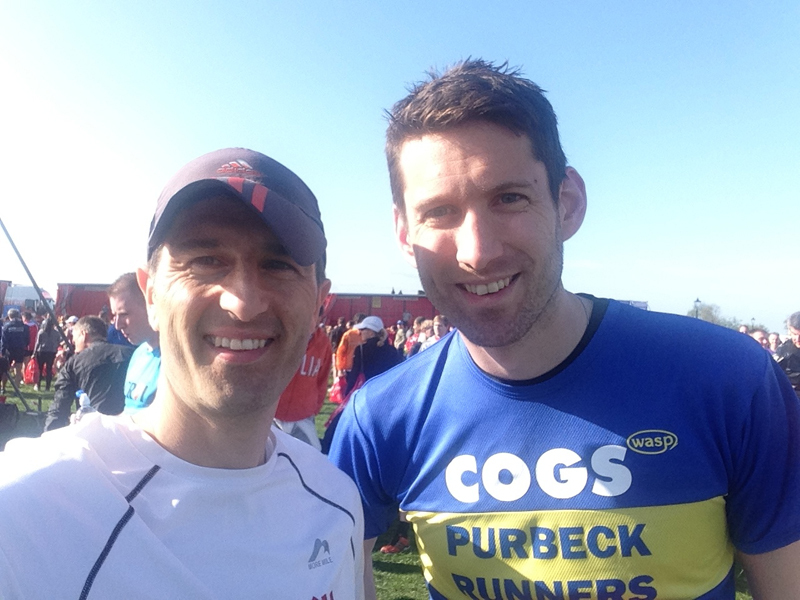 It was a pretty awesome moment to be in a race and see a British running legend out on the same course as you. Unfortunately, my video footage wasn’t totally brilliant but the sun was so bright it was hard to see the screen and capture the right angle.. I was trying to run a marathon aswell! I recall catching up with Ian Berry and Sandra Bowers around this time who were having a fun run around London and seemed to be enjoying the day whilst running with a friend and continued on. Some of the course narrows in places so it felt a bit congested at times as the crowd started to encroach onto the road but the number of runners had thinned out by now and there was plenty of room to run at your own pace. Heading towards the 18 mile point towards Canary Wharf and the pace was still good with an 18-20 mile splits of 6.57m/m, 6.41m/m and a 6.18m/m (although I suspect the last one was a Garmin blip as it read I ran 26.7 miles in total and had been within sight of the blue road marking the optimum race line for most of the race). Loved the colourful support points.. shame I missed each Fetchpoint! Being at a 20 mile point in a marathon I was feeling ridiculously good, I had taken a few gels, was well hydrated and had paced the first half pretty steadily, it was starting to feel like a really super comfortable marathon. A glance of the watch indicated I was around the 2.30 mark and then the finishing time calculations start going in my head. This proved to be a little difficult with the noise and buzz of the crowd and I tried to push that to the back of my mind and just carry on. I then spotted the 3.15 pacer with a cluster of runners around him and drifted ahead thinking he would be running a 7.30m/m pace so if I could get closer to a 7m/m I could put a few seconds ahead and claim a new PB and a Good For Age time (for people of a venerable age). Towards the latter part of the race I caught up with and said hello to Dean Allaway, Jon Errington and Di Roy who was moving well. I drifted on ahead to the continued cheers of the crowd which seemed to get louder and busier and we got nearer the finish. I was still feeling pretty good and continuing the drift past runners as I shot some more video footage. Rather than ticking off the last miles in some sort of final countdown to the end, I took a different approach and tried to take in every sight and the atmosphere. The relentless noise of the crowd encouraged you to keep going, keep pushing, keeping running.. the power and energy of the crowd really made it feel like a big, special event. I then spotted a second 3.15 pacer. Damn, thought I left one of them behind and pushed the pace to get ahead of him to make doubly sure I was going to beat that time. I coasted the last couple of hundred metres to the end finishing in a (chip) time of 3.13.19 which was nearly a 7 minute negative split and a 10 minute PB, a Good For Age time and I felt pretty damn good. 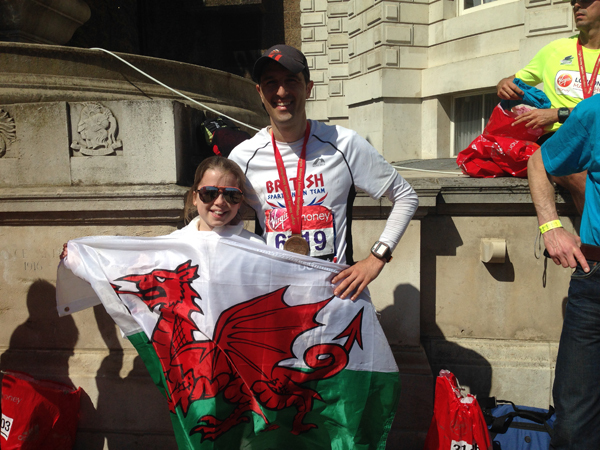 I walked through the finish area, collected my bag and medal which was really well organised and then waited at the meeting point for Sally-anne & Annabelle and Matt who finished in 3.45 and a new PB for him, well done! It felt like (for once) everything had some together for the perfect marathon run. The weather was glorious, the last six weeks running has been good, I paced it really steadily and felt great at the half way point and fuelling and hydration was spot on and I felt great all the way round. The atmosphere and crowds made it a fantastic spectacle and it was really well organised handling such a large number of runners and spectators. 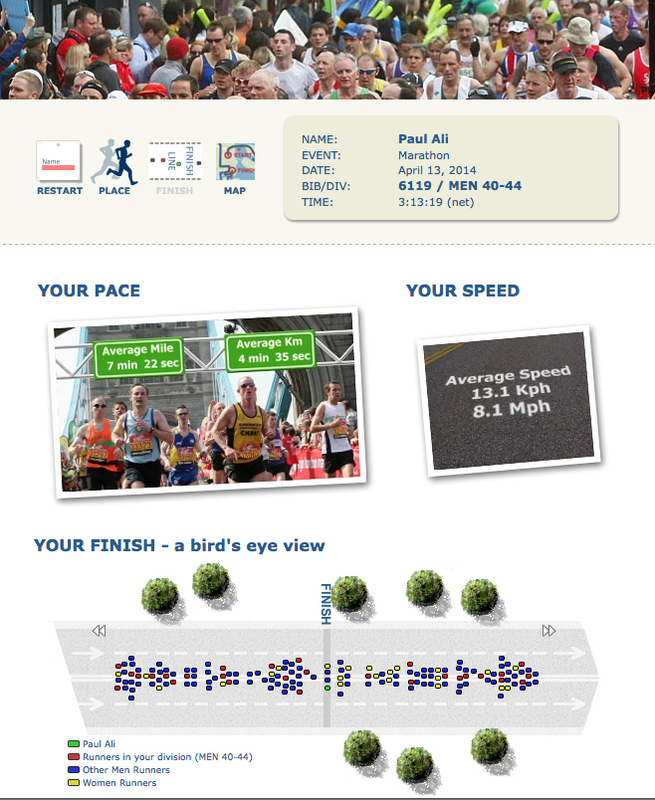 Dare I say it, the perfect marathon effort? A nice stat! Felt good at the end. No doubt a few will ask, could you have gone a bit quicker with a less congested start. Maybe, but would I have felt as great during the latter part of the race? That was probably the most comfortable marathon I have ever run, everything went well on the day, no complaints whatsoever. So, I can finally say I’ve “done” London and I am tempted to run it again. A great day out overall! Next up is the Enigma Good Friday marathon which is about as far apart to London as you can imagine but looking forward to a nice friendly low key (easy!) training run which is my planned last long run before my assault on a sub 20hr time at the Thames Path 100 (Goal 2 for the year). Cheers Guy. Not doing Compton as my wife is doing a Charity Skydive that day. Therefore I’m running a marathon the day before. Stouty will be there though. Great running Paul. 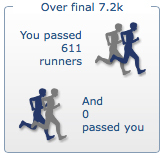 You must’ve passed me (along with 610 others) in those last 7.2km, and then taken another couple of minutes out of me! What an experience, eh? The perfect marathon! What a great result 🙂 plus you must be so pleased that you got a PB while enjoying it to the end, instead of the usual ‘oh god, why isn’t this over?’. That’s the dream isn’t it? I wonder if the good time is because you were forced to be so slow at the beginning. 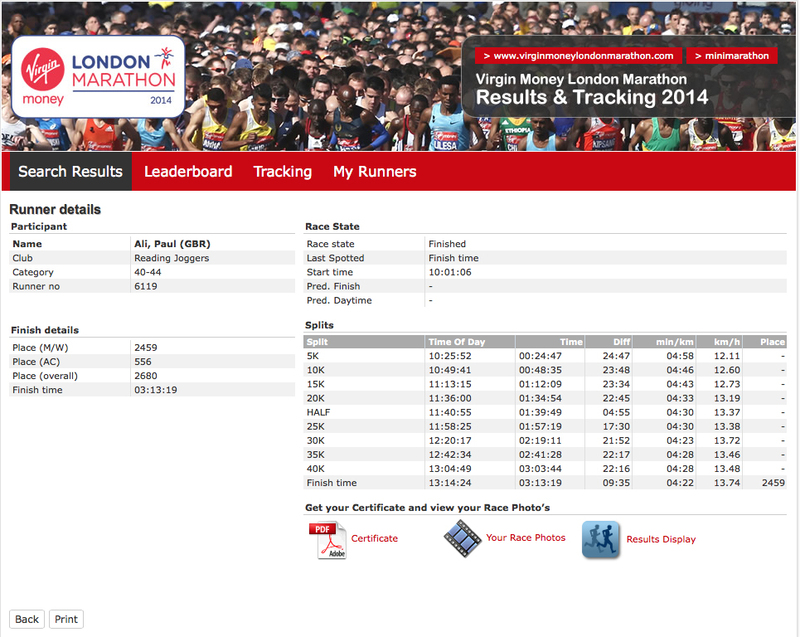 Well done Avon perfect marathon by the looks of things,well done buddy. Really enjoyed your report, I hope I was there to cheer you on as you passed Asda on the Isle of Dogs. Well Done. 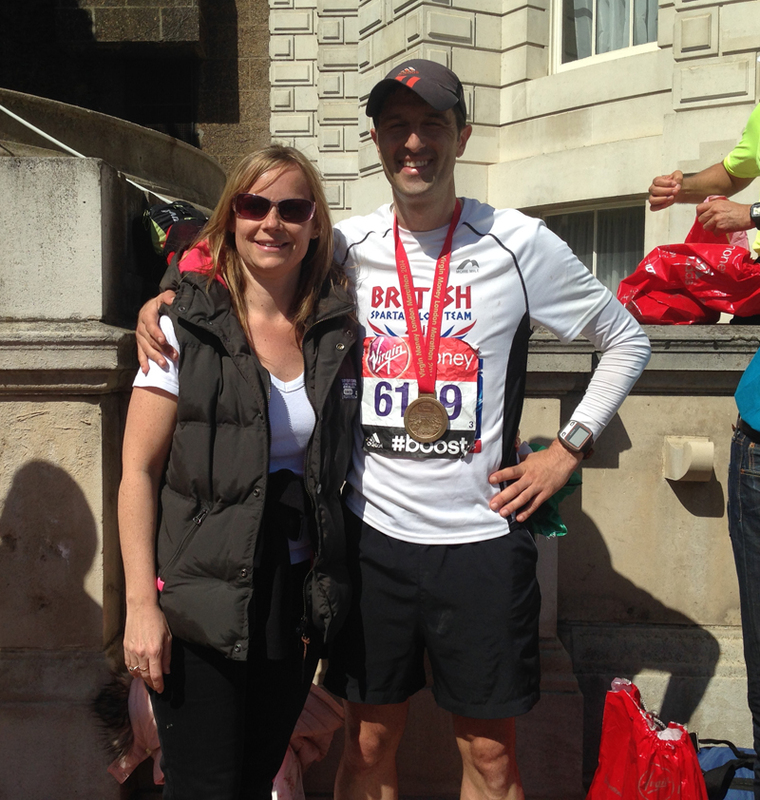 I did the London Marathon a few years ago, and was there this year to support my brother-in-law. We had a great day out cheering everybody on, sounds like you had a brilliant day out as well! Good time to go with it too!